Equinox L5200 - PCI 3.0 with 4.3" display (black) PCI 3.0. Requires key injection in order to accept debit or credit card payments. Please call for more information. The Equinox L5200 payment terminal features a 400 MHz, 32-bit processor for fast transactions and supports streaming or pre-loaded video clips. With its 64MB memory capacity (128MB optional) and a MicroSD memory expansion slot, the L5200 is equipped to handle new value-added applications or video advertising. 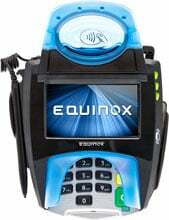 The Equinox 010369-411E is also known as Equinox Payments	010369-411E	or 010369411E	.